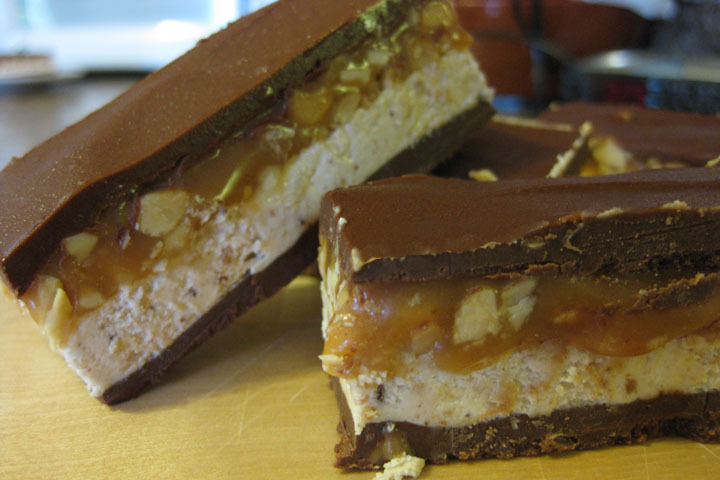 I have a relatively quick and easy recipe for you today – Homemade Snickers Bars. While it may look like a lot of steps, each is quite painless and fast. In fact, every layer except the nougat layer is melted in the microwave (if you want) and the hardneing process in the fridge between each layer is about 5 minutes. You can have these done in under 30 minutes. These are best eaten cool, because once they warm up the chocolate starts melting and peeling off, so store them in the fridge. Line a 9×13” pan with aluminum foil and spray with nonstick cooking spray. Melt together all ingredients in the microwave, stirring every 30 seconds until melted. Spread into a 9×13 pan and refrigerate to harden. Melt butter in saucepan over medium heat. Add sugar and milk, stirring constantly to dissolve the sugar. Bring to a boil and stir for 3 minutes; mixture will start to follow your spoon. Remove from stove and stir in marshmallow fluff, peanut butter and vanilla. Mix until smooth. Spread over first layer and immediately sprinkle peanuts over top. Unwrap and melt the caramels with the cream in the microwave, stirring every 30 seconds until melted. Carefully spread over nut and nougat layer and refrigerate to harden. Melt together all ingredients in the microwave, stirring every 30 seconds until melted. Spread onto caramel layer and refrigerate to harden. Cut into small bars. Keep refrigerated. This entry was posted in Candy Jumbles and tagged butterscotch, candy, caramel, chocolate, peanut butter, peanuts. Bookmark the permalink.